Well I'm starting to get into the groove of book and comic reviews. So I'm pleased to announce that I'm now complete with The Complete Case Files 07. According to the cover which is in glorious pink, it covers progs 322-275 or 2105-06 in MC-1 years. I'm pretty excited for this one as it includes Cry of the Werewolf one of my favourite tales as a child rummaging through old progs. Let's jump in with the breakdown. Story: Cry of the Werewolf (Part 1) - A full moon in MC-1 can only mean one thing...A busy night for Dredd! Escaping from the Undercity via a crack in the city floor, three Werewolves start to explore the city and enjoy the sweet meats. Highlight: Sleep Machine - Total Relaxation Inducers, allows for a full night's rest to be compressed into minutes. Such a creepy idea, I love my sleep! Story: Cry of the Werewolf (Part 2) - The Wolf pack are all naturalized but not before Judge Korkoran bit alongside a citizen. Whilst investigating the wolves bodies it is discovered that on was once Judge Bram, a retired Judge who took his long walk in the undercity! Highlight: Judge Korkoran turning into a Werewolf on the final page. He looks crazy. Story: Cry of the Werewolf (Part 3) - After seeing Korkoran turn into a Wolf, Dredd realizes there was another victim during the earlier attack. As Dredd sends a Judge Team to seek out the victim fresh howls can be heard throughout Buck Chegwin Block. Highlight: The poor neighbours in Buck Chegwin, believing an illegal dog is lose in the block the poor neighbours get a nasty surprise. Story: Cry of the Werewolf (Part 4) - Having controlled the Werewolf outbreak it is now time for Dredd to travel to the source and end the problem once and for all. Highlight: The Undercity - The ruins of the old world paved over to make way for the new Mega-City. Now home to mutants, criminals and other unknown scum. Story: Cry of the Werewolf (Part 5) - Dredd is on the trail of White Werewolf hiding out in Central Park. Highlight: The wolf is lead by a white werewolf and the pack is over fifty strong. How will Dredd cope against them all. Story: Cry of the Werewolf (Part 6) - In an attempt to bring an end to the Werewolf problem, Dredd faces down the entire werewolf pack. Soon Dredd is almost completely overwhelmed and attempts to escape deeper into. After being ambushed by the White Wolf Dredd is bitten before defeating the beast. Highlight: As Dredd slowly succumbs to the wolf virus, he hatches a plan to completely wipeout the pack. But can he stay human enough to succeed? Story: Cry of the Werewolf (Part 7) - With the pack dead Dredd finally succumbs to the White Wolf's bite and completely turns. Driven by a bloodlust Dredd attempts to attack some undercity citizens. Falling within their trap it seems like Dredd is done for! After his rescue and return to MC-1 Dredd is treated and cured. We are even treated to a horrible pun at the end. Highlight: Judge Prager - Ex-Judge on the long walk. After rescuing Dredd, Prager stuns his werewolf form and carries him topside. 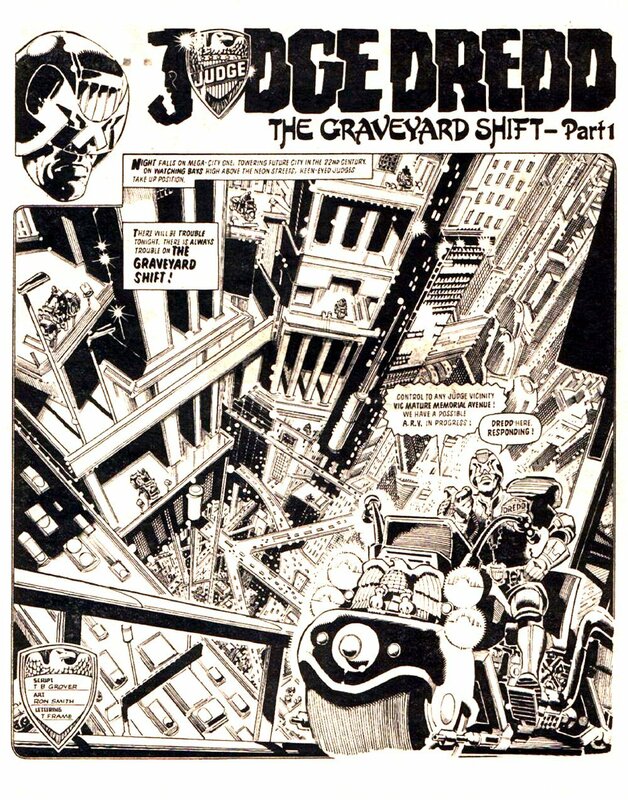 After delivering Dredd, Prager turns and walks back into the darkness. Such a badass. Story: The Weatherman (Part 1) - Composer Carl Heinz Pilchards-in-Tomato-sauce Clayderman has finally lost it. Composing his latest piece in the Auditorium he is abusing the audience with out of control weather. Highlight: The giant hail storm that rains down on the audience. Story: The Weather (Part 2) - Composer Carl Heinz Pilchards has lost it and is currently raining down weather on his poor audience. As Judge close in on the crazed composer, Carl fires off lighting stunning the Judges. 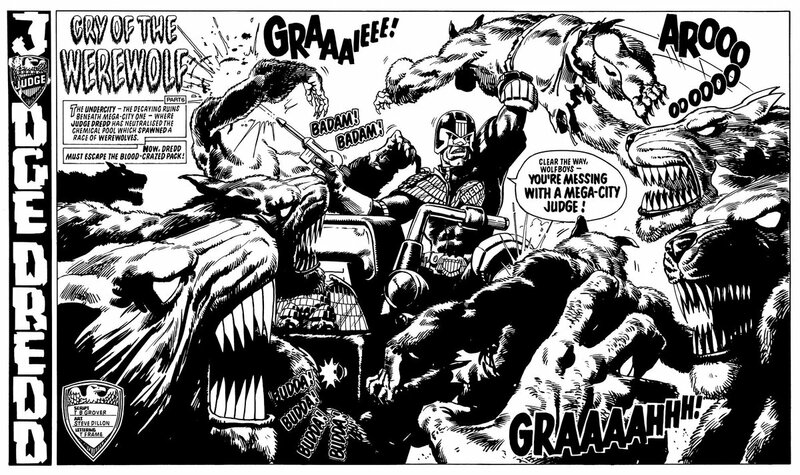 As the show comes to an end Dredd leads the rescue crews in to discover everyone is dead apart from the insane composer. Highlight: Weird tale all together, Dredd wasn't really in it and pretty much everyone died. Weird. Story: Requiem for a Heavyweight (Part 1) - A fattie is discovered dead in the wasteland between sectors. Cause of Death a Bedstead lodged in the Abdomen! What on earth is going on now in MC-1. Highlight: The wonder drug of the future - Appetite Inducer. When taken in large amounts the victim can't stop eating. They must eat or be driven mad with hunger pains. Story: Requiem for a Heavyweight (Part 2) - With Pudge dead his manager is on the look out for his next pig. Having discovered a contentor in Frank Cannon Segregation block, the manipulative Manager organizes an escape plot. Highlight: Charge of the Heavy Brigade. Having been lied to residents of the Segregation block rush Judges in an attempt to access free food. Resulting in the death of two Judges and the escape of Arnold Stodgman. Story: Requiem for a Heavyweight (Part 3) - The 27th Heavyweight eating Championship is underway. This highly illegal competition is being held in the abandon Cyril Lord block out in a destroyed sector. 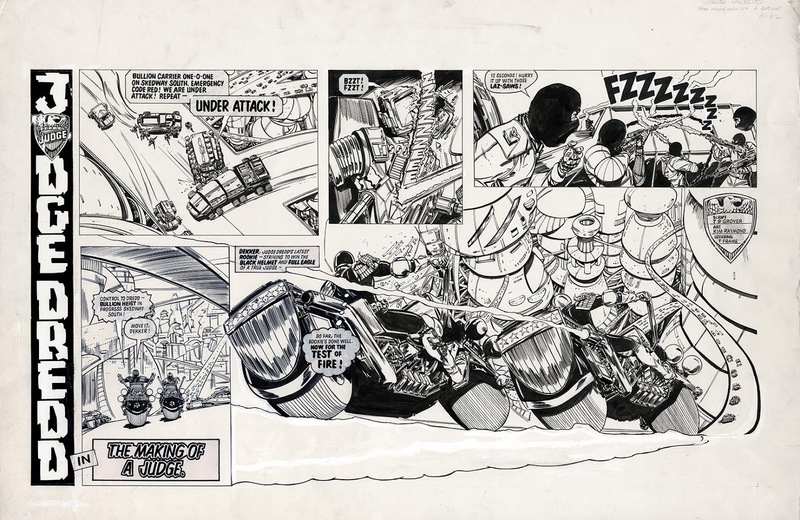 Unlike for guests and contenters alike Dredd is also on hand. Highlight: Arnold Stodgman achieves the incredible ton in a hour but is never going to be crowned the winner. He dies from the pressure of all the food and dies as the Judges arrive. Story: The Graveyard Shift (Part 1) - Seeing a new point of view from the judges view point. This time we head into the shadowy graveyard shift. Were in one evening 9000 serious crimes will be committed including the death of a judge. Highlight: The Judges take down a Juve gang with extreme prejudice. Story: The Graveyard Shift (Part 2) - The night is still young and the graveyard shift is really heating up. Snipers, citizen vigilantes, mutant infiltrators, out of control fires and a four way Juve fight are all underway. How on earth do the Judges maintain control? Highlight: Jerry shooting back at the Sniper due to being made late to the theatre. Story: The Graveyard Shift (Part 3) - The Larry Hagman Conapts is now a total inferno, death toll reaches 3350 before the fire is under control. Then we get to see a real seedy underbelly of MC-1 - Bite Fighting Pits. Highlight: Southfork holds a Burn Up Party BBQ to celebrate the Larry Hagman fire. Story: The Graveyard Shift (Part 4) - When is this crazy night going to end? Not only has a Block War started, but also Mob Blitzers are attacking a rival mobs nightclub. To make matters worse mutants are still attempting to break in, a hold all containing just left hands is discovered and a Citi-Def force is planting explosives under a rival block. Highlight: Para-Glider Citi-Def. Jumping from their block to raid the rival block across the street. Unfortunately for them the Judges were prepared and shoot them out of the sky. Story: The Graveyard Shift (Part 5) - It's only 0150 hours. Now the ST. CLAIR/MONROE blockwar has escalated. St. Clair sending in an infiltration unit, have managed to blow the foundations of Monroe and caused a block collapse. As the Monroe block falls it cracks open the plaza, causing St.Clair to topple to. Over 100,000 dead in seconds. Highlight: Whilst attempting to save a baby Dredd throws the baby to waiting Judge Lyall, before plunging off the falling block. Story: The Graveyard Shift (Part 6) - Dredd is falling to his death after saving a baby. His only chance is to grab hold onto a handrail of crosswalk. Though managing to grab it Dredd dislocates his shoulder. We are then treated to a couple of pages of weird MC-1 crimes and shown the fall out of it all as Rysk is overrun with dead people. Highlight: Sector 80 and it's hungry alien escape. A creature from the Netherworlds Exhibition has escaped and has so far ate 17 citizens. Story: The Graveyard Shift (Part 7) - We are now at 0315 and on the case of the Left Hand killer. A psycho with a Heavy Duty Disintegrator. After apprehending the killer, the night starts to slow down, allowing Dredd and the other Judges a brief respite for a sleep machine break. Highlight: Jean Paul Blatty - The Left Hand Killer. Was attempting to beat the record for 1 on 1 murders. Sadly he only achieved 129 shy of the crime by 6. Story: The Suspect - We get a rare glimpse into the ISO-Cube interrogation cells. Here we watch Dredd interrogate a perp, but after hours of attempting to get a confession Dredd has to let him free. Knowing him to be a criminal Dredd uses Spy in the Sky in catch him out. Highlight: Working too many jobs. The perp was working 3 jobs, in a city with sky high unemployment this is an unforgivable crime. Story: Rumble in the Jungle (Part 1) - MC-1 Justice Department unveils it's newest weapon on crime. The Manta Prowl Tank. During it's first true test run Dredd is a the helm and fears a Juve Rumble is about to happen in the The Jungle. Highlight: Juve Gang names: Bernie Beesley Block - Bad Boys, James Dean Block - Juves without a cause, Morgan Fairchild - Flamingoes, T. Dan Smith/Roy Orbison - Juve Alliance, The Bruce Kent Bombers, The Lobsang Rampant Beast Pack and the Bob Marks Block Y-Bobs. Story: Rumble in the Jungle (Part 2) - The Y-Bob's have stolen some massive Rad-tractors (designed to flatten tower blocks) and are riding them into the middle of a Juve Rumble. Highlight: The Juve rumble. It's an all out fight, the Jungle has become a killing ground littered with the dead. Story: Rumble in the Jungle (Part 3) - Dredd is leading a team of Judges against the Y-Bobs. Driving off a higher up bridge the team lands on top of the lead tractor and starts taking down the Y-Bob's. Soon the Judges have taken control of the tractors. Highlight: With three giant tractors under their controls, the Judges turn them on the waring Juves and herd them into a bottleneck where they can arrest them at their pleasure. Story: Bob & Carol & Ted & Ringo (Part 1) - Irrawaddy Skinnier and his Dinosaur Extravaganza are visiting MC-1. What could possibly go wrong with giant dinosaurs from an Atomic Wasteland. Highlight: Bob, Carol, Ted and Ringo are all T-Rex's, looked after by the over caring Granville the Robot. Story: Bob & Carol & Ted & Ringo (Part 2) - Granville the T-Rex handler has lost the plot. Believing to be doing what's best Granville releases the T-Rex's and attempts to lead them back to the wastelands. Highlight: Four T-Rex's sneaking through MC-1 was never going to run smoothly. Soon damage is done and the first fatalities start to happen. Story: Bob & Carol & Ted & Ringo (Part 3) - Having almost made it to freedom the T-Rex's get distracted by the Mutie Holding pens and soon a feeding frenzy begin. This gives the Judges just enough time to catch up. Highlight: The poor muties who are now just a lunch snack for the T-Rexs. Story: Bob & Carol & Ted & Ringo (Part 4) - The rampage is nearing an end, having been left with no choice the Judge kill the T-Rex Bob, but in the ensuring chaos the other three escape in to the wasteland. 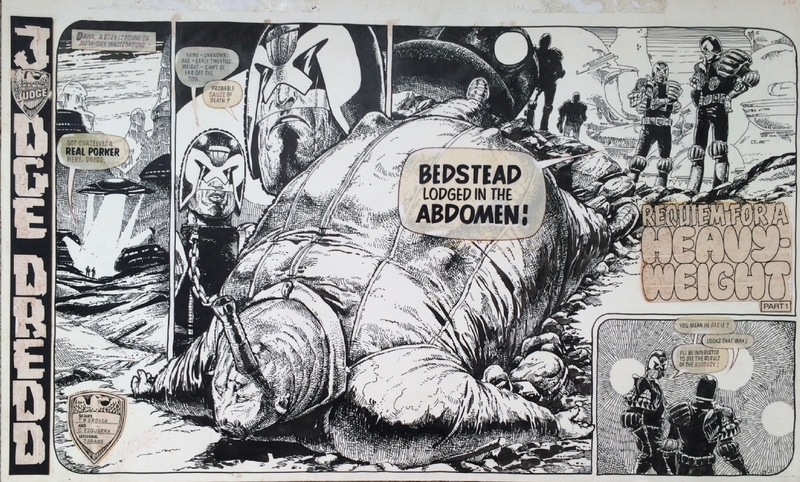 Highlight: After speaking with Granville, Dredd let's the beasts go free. 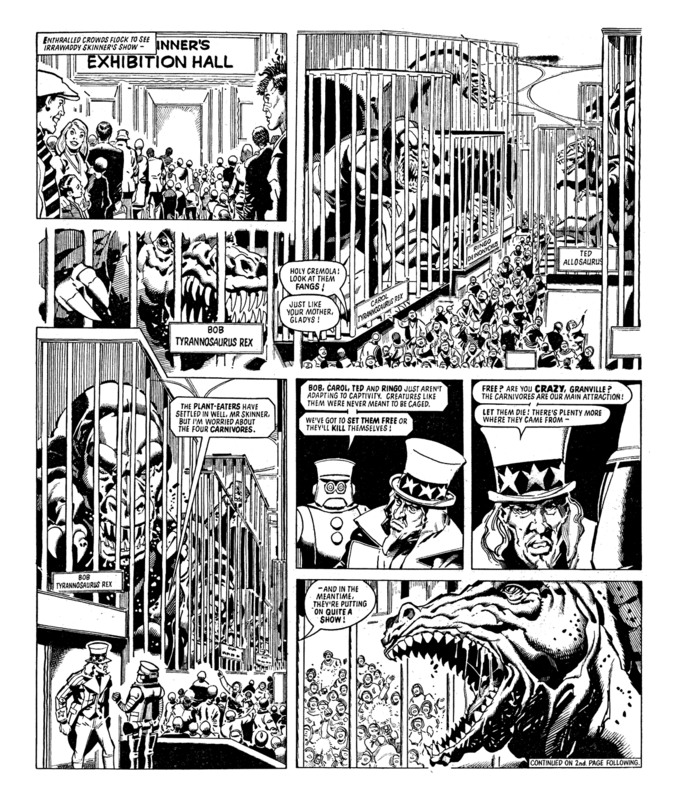 Instead Dredd arrests Skinner and sentences him to 17 years for the damage caused. Story: Pieromania - Whilst on a routine patrol Dredd is Pied in front of a roving camera. Soon this one act of fun creates MC-1's newest craze. Soon entire block wars are being fought with pies. Highlight: Wanting to ban pies a councillor uses the line - "Let them eat cake!". Story: The Highwaymen - In the future even the constantly moving Roadsters of the MC-1 mega ways aren't safe from crime. Here enters the Highwaymen, using grapples they board the unexpecting victims and raid them before driving away to freedom. Highlight: Mopads - Mobile Homes that permanently move. The families never set foot on non moving ground, there are even mobile malls for these families to shop in. Story: Are You Tired of Being Mugged? - A new company has risen, offering the citizens of MC-1 protection from being mugged. The G-Men specialise in counter violence, but soon mugging crime numbers drop, leading to the G-Men becoming victims of violence aimed at them. Fearing a loss of control the Judges revoke a ban on anti mugging suits (a cheap if more dangerous form of protection) leading to the downfall of G-Men. Highlight: Kent Fassbinder - Owner of the G-Men company having been made bankrupt resorts to mugging and is killed by an anti mugging suit. Story: Bob's Law - Following the destruction of large amounts of the city the Justice department attempt to reorganise the remaining blocks into a new number system. Highlight: As with everything in MC-1 nothing is easy and soon the population is rioting all across the city. Story: Citizen Snork - James Snork, just an ordinary boy living in MC-1. Then one day after watching a vid show, Snork decides to grow the biggest nose ever seen! As Snork's fame grows he soon catches the eye of the "Collector" a crime who loves collecting weird human oddities. Highlight: In order to save Snork's life Dredd is forced to shoot citizens Snork's nose off! Returning the poor boy to a life boredom. 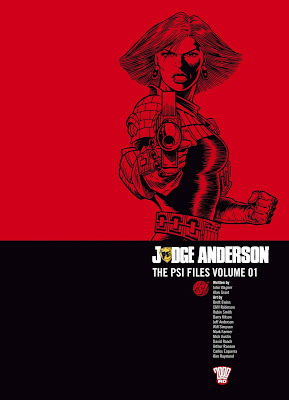 Story: The Haunting of Sector House 9 - Dredd is investigating the death of Sector Chief Judge Erikson of Sector 9. It soon becomes apparent that this is no ordinary occurrence, but who has the power to psychically attack a Sector House? Highlight: Judge Omar - Head of PSI Division. 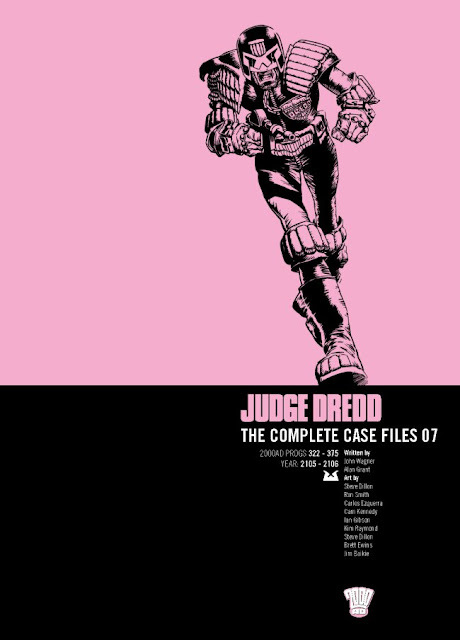 He is a badass Judge and one of my favourite characters of this era of Dredd. Story: High Society - We join Dredd in Space at the Nelson Rockefeller Orbital Suburb, home to the rich of MC-1. A perfect floating sector with no pollution, crime or riff raff. That is until Dredd comes along with his Slum clearance act of 2105. Meaning that 29% of the homes have to be donated to the public sector. Highlight: As soon as the public is allowed on board the flying city becomes a cesspool of crime and diseases, forcing the rich to abandon homes and soon Rockefeller is nothing more than a flying slum. Story: The House on Runner's Walk - Reuben Henk is a perp on the run. Rushing into Old Town, Reuben gets more than he bargained for upon entering the local Boarding house. Highlight: Lodgers of this boarding house are soon lobotomised and mind controlled. A clever scheme to get their welfare cheques and have the perfect house guests. Story: Portrait of a Politician - Dave the Orangutan is just your normal ape hanging out in the local bar. That is until though a run of luck (not sure if good or bad), ends up as mayor of MC-1. Highlight: Dave becomes mayor and all Dredd can say is: "Judging by his predecessors. Dave could be a definite improvement". Story: The Switch - After a first time arrest for a perp following a pro robbery. Dredd feels something isn't adding up. Soon he discovers a corrupt Judge has swapped places with a normal citizen. Highlight: The switch victim has served 12 years in one of the most harshest jails known to MC-1 law. How on earth do you come back from that? Story: Superbowl - Following a threat to the radiator team Dredd and Rookie Judge Dekker are assigned as protection. What happens next sees 5 star players and the head coach arrested for a variety of crimes. Highlight: Turns out it was a Hoax call and the team was never under threat! Story: Bingo - Even in the city of the future Bingo is still a hideous compulsion. Dredd and Rookie Judge Dekker are on the scene of the latest game and have to carefully shut it down without causing a medical emergency. Highlight: Rookie Judge Dekker - pretty much doesn't need Dredd. Even in his own words she is one of the best Judges he has trained. Story: The Making of a Judge - It's time for Rookie Judge Dekker's final test. Armed robbery! Can Dekker perform and pass Dredd's judgement? Highlight: Dekker smashing through a hab block window and taking down three perps. Story: The Wreckers - Judge Dredd is given 48 hours to clean out Sector 27 of the Wreckers and is given a task force of 100 judges. 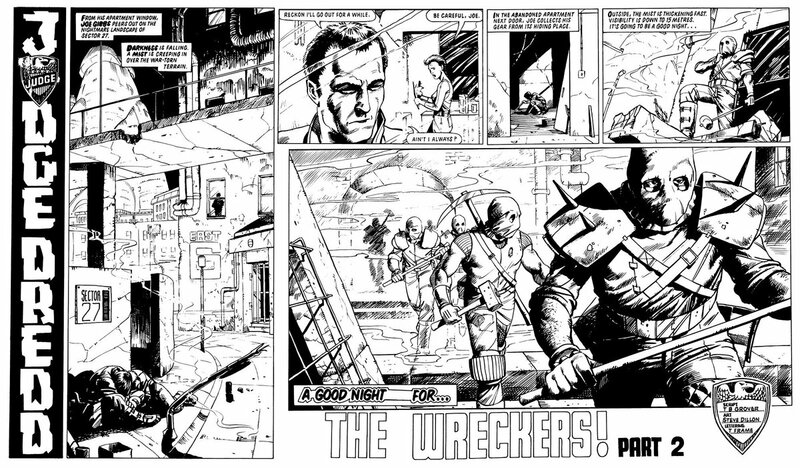 The Wreckers themselves have home field advantage but how long can they hold out against Dredd? Highlight: This is a great tale! I love seeing the average struggling citizen driven to crime and then the fall out of the Judges coming down on them. It seems so harsh! This was a return to classic Dredd, mini tales of random adventures that really showcase the city and it's weirdo's. Highlight's for me include the werewolves, fatties, Judge Omar, Judge Dekker and the Wreckers. I've been away from Dredd for to long and I am happy to be jumping back in. Here's to Complete Case Files 08.